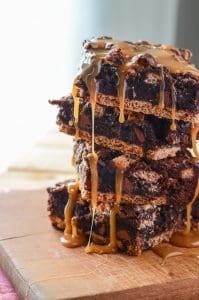 Amazingly easy gooey s’mores brownies, stuffed with caramel, chocolate chunks & marshmallow, set on a graham cracker crust & drizzled with more caramel. I can’t even with these brownies. You know, I really dislike that phrase, but I use it anyway, especially in situations like this trashy s’mores one. Just like I say YOLO from time to time and bite my tongue every time it falls from my lips. I’m too old to be using new slang, I think, but my brain sometimes gets confused about my age, and I can’t help when it slips. Back to the point. 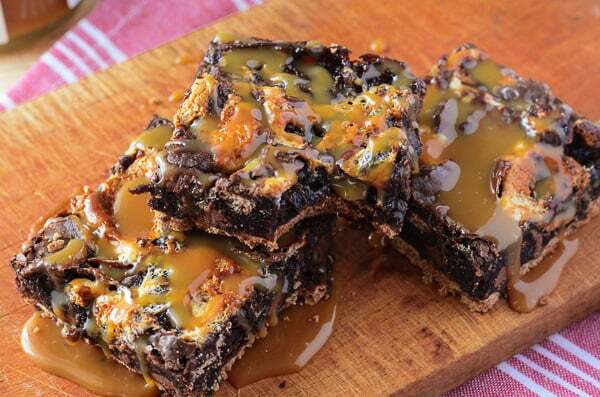 Caramel S’mores Brownies. It’s like three of the best foodie things in the world got together for a party, got a little rowdy, passed out in my oven, and ended up here on the blog. A necessary sacrifice, if you ask me. I’m gonna be straight up here and tell you that I was not 100% happy with the way these looked fresh out of the oven. Which is almost blasphemous, since warm brownies are surely one of God’s greatest gifts to mankind. I can only blame my rookie mistake: I tossed the marshmallows on top waaaaaay too early, which toasted them, sure. But it also left the tops a craggy, multicolored mess. All the fluff had fluffed out. I could have broiled them on top at the very end for that roasted marshmallow look, sure. But I wanted them really baked on there. Since there were marshmallows baked in the brownies, I wanted just an accent of them on the top, just representin’ the marshmallow life inside. I don’t know why it mattered. 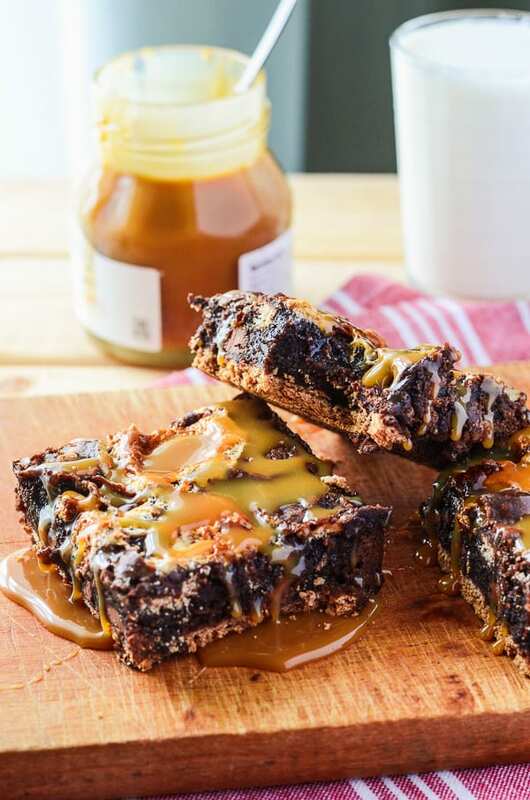 Ultimately, I knew I was going to amp up the caramel content with a drizzle on top, which was going to cover anything it fell on with a heavenly amber shimmer. Get ya some of that drizzle. 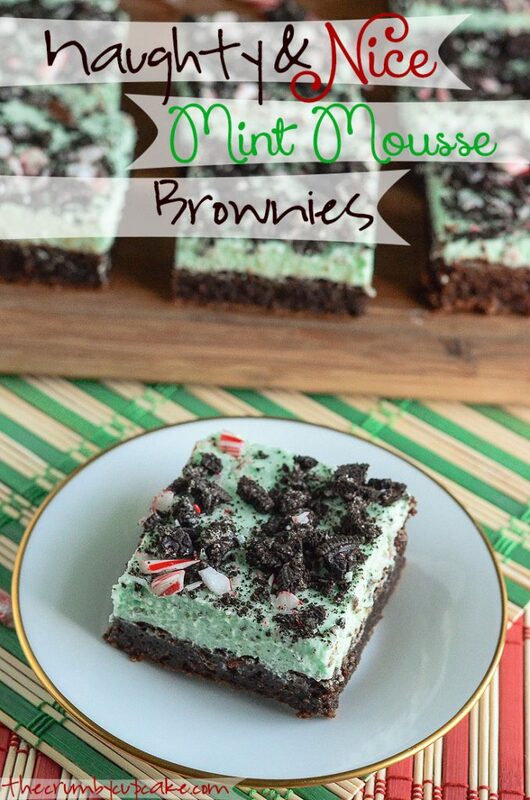 One of the coolest things about this recipe is that it’s totally made from a boxed mix. I know, I know. Food blogger. Box mix. More blasphemy. Box mixes are not inherently evil, you know. 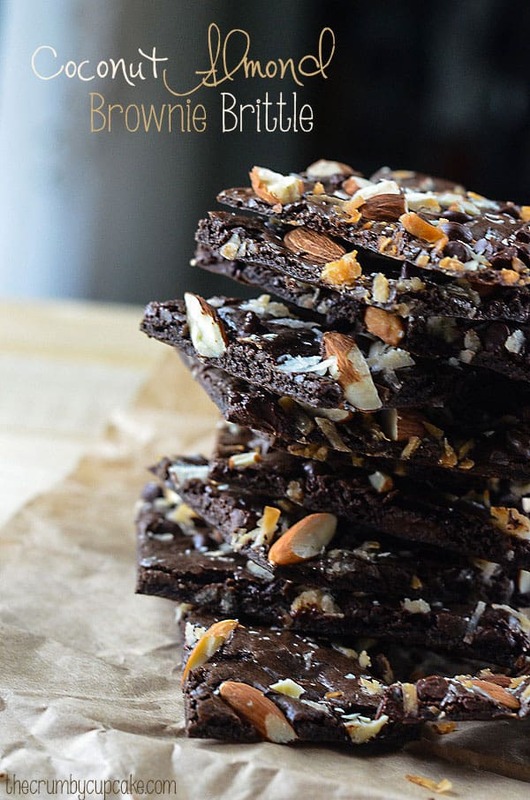 They’re super easy to jazz up, and are beyond convenient, and until I get on my homemade brownie mix game, they serve their purpose when I want near-instant chocolate gratification. Adding the caramel and marshmallows to this box did the trick. They are soooooo moist and fudgey! The marshmallows melted, so they’re undetectable by looking at these babies, but oh buddy, they’re in there. If you’re looking for maximum s’mores flavor, you’ve found it right here. And don’t worry about the gooeyness oozing right out of your hand – the graham cracker base is like a tiny, crispy plate, keeping it all together. So you can keeping going back for another bite, and not end up with marshmallow all over your mouth. 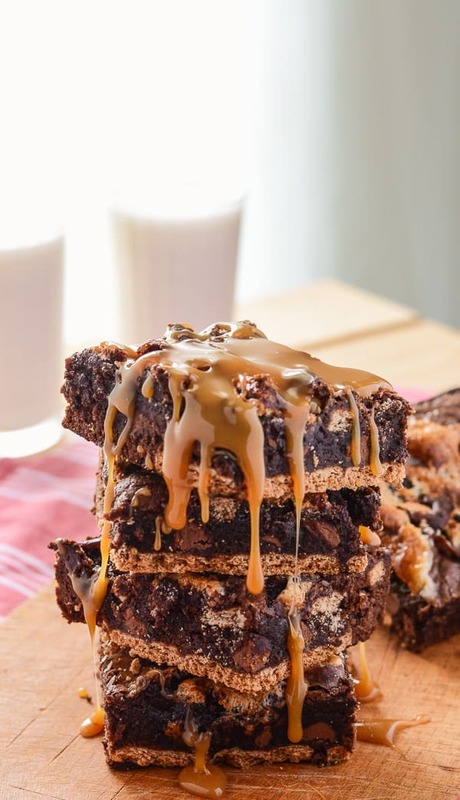 Amazingly easy gooey s'mores brownies, stuffed with chocolate chunks & marshmallow, set on a graham cracker crust & drizzled with caramel sauce. Preheat oven to 350 degrees F. Line an 8x8 pan with parchment paper and spray with cooking spray. Line bottom of pan with 4½-5 graham crackers, breaking squares off to fit to form a base. Set aside. Prepare brownie mix according to box instructions, adding the vanilla and espresso powder with the other ingredients. Mix until just combined, then fold in the caramel sauce, chocolate chunks, ¾ cup marshmallows, and remaining crumbled graham crackers. Pour batter into prepared pan and smooth out. Bake for 15 minutes. Open the oven and carefully scatter the remaining marshmallows evenly on top of the setting brownie batter. Continue to bake for 25-30 more minutes, until a toothpick inserted in the center comes out clean and the sides are beginning to pull away from the pan.. Cool completely before drizzling with more caramel sauce. Serve and enjoy! What is your favorite way to dress up brownie mix? 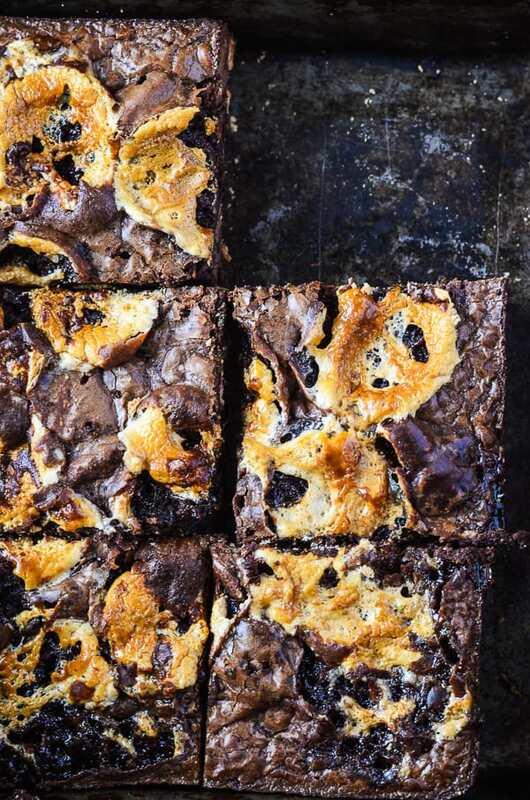 Looking for more brownie goodness? Check out my other yummy recipes! Just wow! I’d normally write a more thought provoking comment on blogs but those 2 word say everything! These look BEYOND delicious – YUM!! 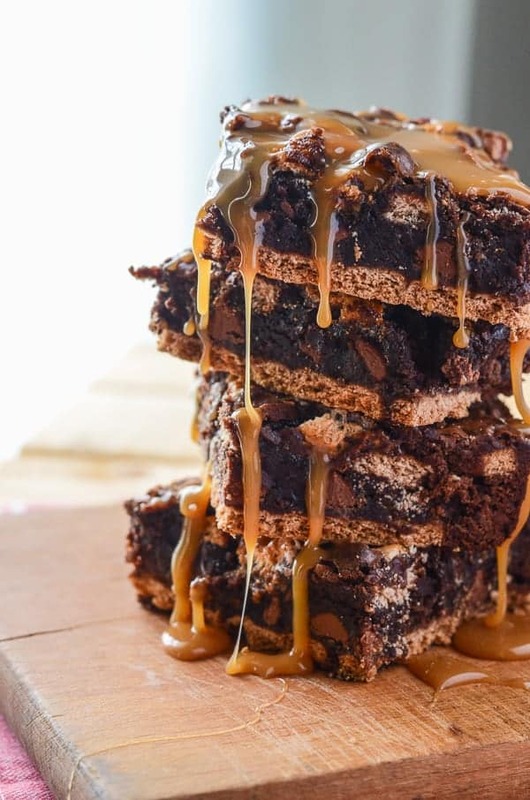 Caramel – S’mores – Brownie – what’s not to love? 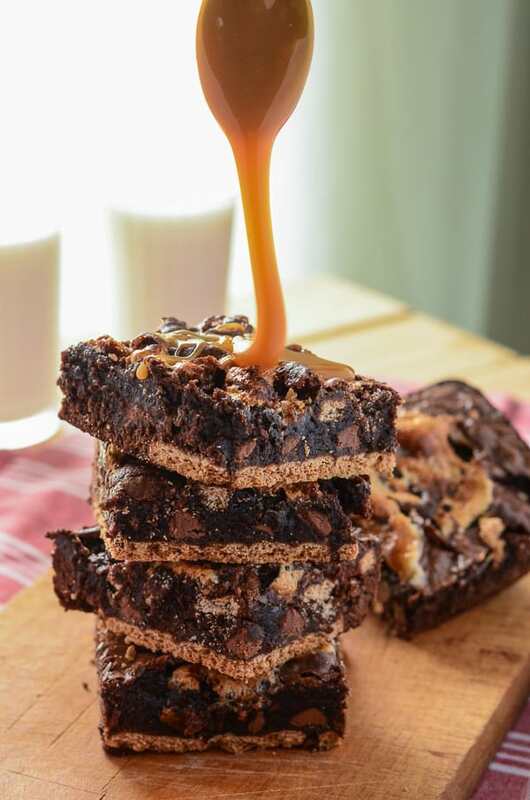 That drizzle is the perfect topping to that brownie. Don’t tell, but most my brownie creations begin with a boxed mix. Looks like the perfect breakfast to me. No shame in our box mix game, Alli. ;D None in brownies for breakfast, either! Wow, oh wow! These just look heavenly. I just love caramel and chocolate together. 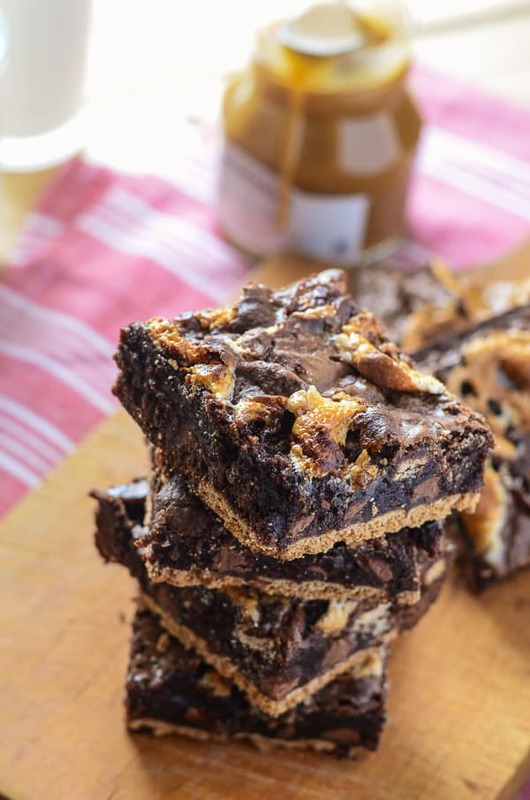 Mix ins really make box brownies 100 times better, girl! 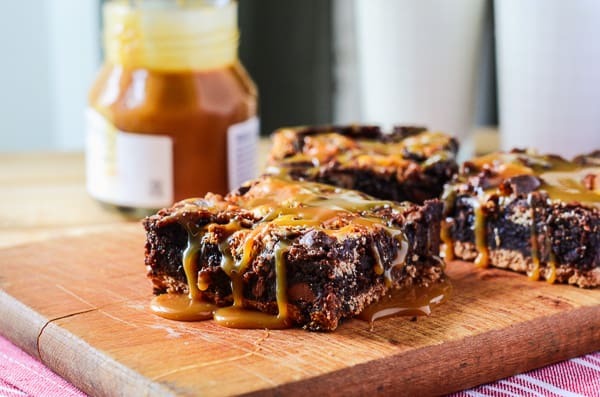 And seriously, add the vanilla and espresso powder, if nothing else – it takes even plain brownies to a whole new level! Ok so yeah “I can’t ” either lol! I saw the title and had to click on it! Some of my fav ingredients (sweets) in one recipe! I’m definitely gonna try this, YUM! Shame on you Erica this is SINFUL CARMEL BROWNIES oh so lovely just for me. I love that these start with a brownie mix! Absolutely delectable! Can’t wait to pin! I’m guilty of using brownie mix a LOT. I love homemade brownies, but there’s something about box mix that just reminds me of childhood! as usual, these look PERFECT!! !